Republican candidate Donald Trump has taken a commanding lead over Hillary Clinton in the key swing states that will decide the White House election. He won Florida, Ohio, Iowa and North Carolina, while Democrat Mrs Clinton took Virginia and Nevada, ABC projects. Pennsylvania is too close to call. Markets lurched as Mrs Clinton’s path to victory began to narrow. The mood is dark at Mrs Clinton’s election night party in New York City. Hillary Clinton’s supporters thought they’d arrived for a victory party, and the roofing at the convention centre in New York doubled as a metaphor – a giant glass ceiling ready, symbolically at least, to be shattered. But under it the mood fast changed to concern and fretfulness as early all-important swing states, like Florida and Ohio, went to Donald Trump. Nervousness turned to utter disbelief as reliably blue Democratic states like Michigan and Wisconsin looked to be turning red. The famed blue wall, which has made the Democrats so strong in presidential politics, looked to be crumbling before their eyes. Now the mood is one of despair. The Republican candidate earlier racked up wins in the Midwest and South, while Mrs Clinton swept the Northeast, ABC News projects. As expected, he has been victorious in the Republican strongholds of Utah, Alabama, Kentucky, South Carolina, Nebraska, Indiana, West Virginia, Mississippi, Tennessee, Oklahoma and Texas, ABC projects. And he took Georgia, Missouri, Montana, Louisiana, Arkansas, Kansas, North Dakota, South Dakota, Idaho and Wyoming – all solidly conservative states. Mrs Clinton won the Democratic heartlands of California, Oregon, New York, New Jersey, Connecticut, Massachusetts, Maryland, Vermont, Delaware, Illinois, Rhode Island, Hawaii, Washington and District of Columbia, as well as New Mexico and Colorado. Voting has now ended everywhere but Alaska, and full results are expected imminently. 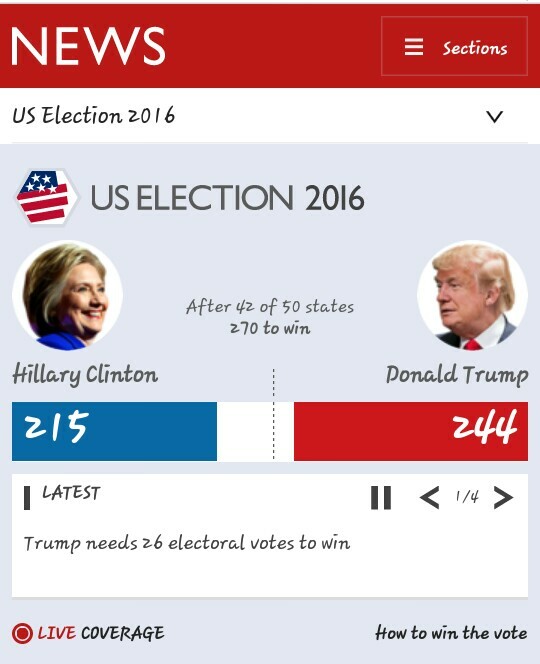 Mr Trump, a 70-year-old Manhattan real estate tycoon, and Mrs Clinton, who 69, would be the first US female president, voted earlier on Tuesday in New York City. 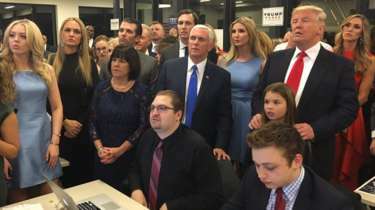 Mr Trump was booed as he arrived to cast his ballot at a school in Manhattan, alongside his wife, Melania, and daughter, Ivanka. events barely a mile apart. Mrs Clinton will address supporters at the Javits Centre in Manhattan, while Mr Trump holds an event at the Hilton Midtown hotel. More than 5,000 police officers have been deployed across America’s biggest city to keep order on election night.